CEBU CITY, PHILIPPINES — Drop jaw while drops of super dropped prices allow you to shop till you drop. The “Cebu Travel Catalogue 2015,” a three-day affair gives travel enthusiasts the chance to avail of cruises, European pilgrimages, Asian and US tours at half the price. The event at the Ayala Center Cebu from January 30 to February 1 will showcase an 80-booth spread for various travel agency, tourism offices, airlines, real estate and insurance firms. Booths will occupy the Terraces area and the connecting corridors. According to the Cebu Travel and Tours Association, through its president Sheila A. Colmenares and event chairperson Aida L. Uy, that the event has garnered, so far, the support of the Malaysian Tourism Board, Citrineland Corporation, Innoland Retail Division (Serenitea, Hikay, Dong Juan, Sunburst). Cebu continues to be an “emerging powerhouse” in the national tourism country as it is only able to attract an average of two million international tourists annually. As implied by former resort and hospitality insider Bruce Bollozos of Innoland Retail Division that compared to Indonesia’s 60 million foreign tourists yearly, our share of the world tourism pie can be likened to getting only crumbs and morsel from a banquet table. Thus the need to invigorate more domestic and international travel by offering so-called shoestring packages. “It is the essence of the event to allow travelers to get packages at prices they can’t get at any other time of the year. Through Cebu Travel Catalogue, they get better deals that they can use during summer travel,” CTTA said in a statement. The association even dangles a chance for consumers to enjoy a super markdown of up to 75 percent for certain packages especially among traveling families. Photo caption: This writer personally recommends Skechers GOrun with Goimpulse sensors (mid-foot strike). This product elevates the natural running experience, allowing the runner to interact with and respond to practically any surface, while offering the additional benefit of real world protection. Innovative placement allows the GOimpulse sensors to move together and independently as they provide sensory feedback to the brain. This dynamic interaction promotes a natural stride for a more efficient and responsive run. The perk is that this can double effectively as trek shoes. This writer went up Mt. Apo recently “onboard” her Skechers GOrun which she purchased at P4,100/pair at the Ayala Center Cebu store. It’s an awesome, superb product protecting her beautiful feet throughout the journey on Mt. Apo’s spectrum of environments. CEBU CITY, PHILIPPINES — Eritrean-born marathoner Meb Keflesighi may have once lost his charm in the running world after reaching a peak in his best records. But when Skechers, a brand of high-end footwear in the US, signed him up for the Boston Marathon 2014, Meb (preferred as second reference to emphasize how he is called in the runners circle) ran his race and finished it with ultra photofluorescent colors as he donned the third generation of GOrun shoes. Shares Henny Sescon, marketing associate of Skechers Cebu, that Meb has successfully corrected his stance with an improved pair of shoes designed to promote midfoot strike, countering a widely accepted notion that it’s more speedy, proper, and beneficial to run with a heel strike. Studies show that a strike on the middle foot, or onto the arch of the foot, stimulates nerves better and that the runner doesn’t come down too heavily on the ground. This means lesser injury on the shins, the knees, and the hips over time. Midfoot strike distributes the load on the ground, not on one’s calf. As opposed to the heel strike which overcompensates the muscles, thereby sending the shock to the shinbone. A midfoot strike maximizes stability and enables better running performance because of the stability of one’s center of gravity, a video on running performance on YouTube emphasized. At 38 years old, Meb was able to prove that with better running shoes he still could demonstrate another personal best. He won this year’s prestigious Boston Marathon. Sescon went on to announce the launch of Skechers Nite Owl 2.0 for safe and smart running. She mentioned of Skechers’ concern on runners usually training and tuning-up at nighttime instead because of the hectic schedules and daily responsibilities in the daytime. Many opt to do either early morning or evening runs. But that training sessions at night has its drawback, since some runners while enjoying the cool atmosphere of late hours and unwinding after work with a good workout, also expose themselves to risk, what with the lack of road courtesy for runners here. While training in the evening is a pleasant experience, safety is the major concern due to poor visibility on the roads especially at night and during the wee hours of the day. Runners have the tendency to use the outermost lane for the lack of a pedestrian lane throughout a thoroughfare’s stretch here. To better address the runners safety needs, producer of technologically advanced and award-winning footwear – Skechers Performance Division – introduced an innovation exclusive to its top performance brand Skechers GOrun called the Nite Owl, designed to glow in the dark. Carrying the same vision as its pioneer comes the release of the Skechers Nite Owl 2.0, this is on GOrun3 and GOrun Ride 3 series enhanced with photoluminescent technology which makes the running shoes glow when exposed to darkness or in low-light conditions. The product also features the banner technology of Skechers GOrun series – the midfoot strike (M-Strike) technology. Inspired by barefoot running, the principles of minimalism encourages runners to run more naturally by positioning the body for a midfoot strike in order to run faster, stronger, and longer. GOrun 3 is also as lightweight as its predecessor with improved breathability and flexibility, allowing the wearer to run faster and more efficiently. The Skechers Nite Owl 2.0 is also bringing in new colors: hot pink and lime for ladies, and green for men. As for practical benefits of being barefooted, there is a term in Cebuano called “panguma” wherein the toes perform the same task as that of the claws when challenged. The literal foothold allows the person to cope at balance. The task is very good for motor planning as the brain directs the proprioceptive sensors of our body to move accordingly and therefore avoid tumbles, falls, or slips. 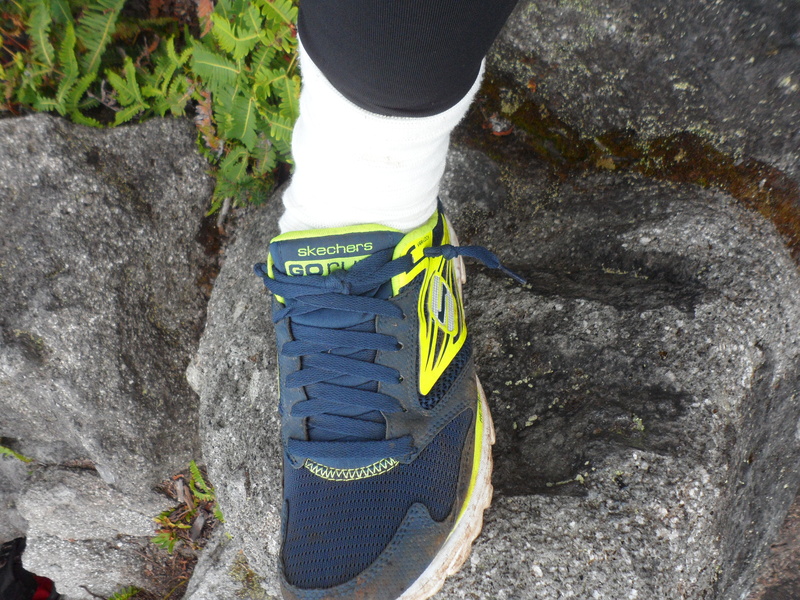 This writer, who is a sprinter in her younger days, shared to Sescon how Skechers GORun version 2 was tested on her Mount Apo Climb (Kapatagan-Kidapawan traverse) in 2013. This writer narrated that it was to find out whether impulse sensors built on the soles of the GOrun model would indeed stimulate the brain to adjust to heavy impact terrain, as Mount Apo, considered the roof of the Philippines, is a combination of boulders, muddy paths, nine river crossings, and a black mud swamp most difficult to tackle. This writer completed the journey in three days, two nights, with blue-neon green GOrun Skechers shoes still intact. With the launch of photoluminescent glow tech-inspired shoes here, Skechers also promotes Meb’s choice to “go like never before,” as is the tagline of Skechers’ global campaign.